These little tacos in a bag, often called walking tacos, are equally perfect for game day get togethers, busy school nights, or even camping… So simple and easy to make! You might be wondering just exactly what are walking tacos, and I totally get your confusion. I was also puzzled the first time I heard the term… I mean, tacos seem pretty portable as is. Right? But after learning that they’re just typical taco fixings added to a snack size bag of Fritos (or Doritos, as commenters have suggested), I am totally in love with them. I mean they’re easy to make and relatively mess-free — what’s not to love? 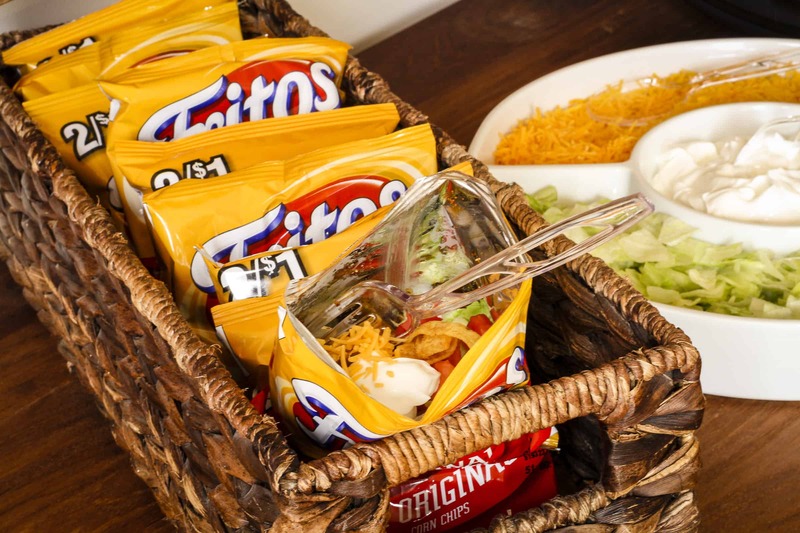 Walking tacos are not only perfect for quick meals before I have to get the kids to the sports practice of the day, they’re also a fantastic option for game day get togethers. What Is In A Walking Taco? 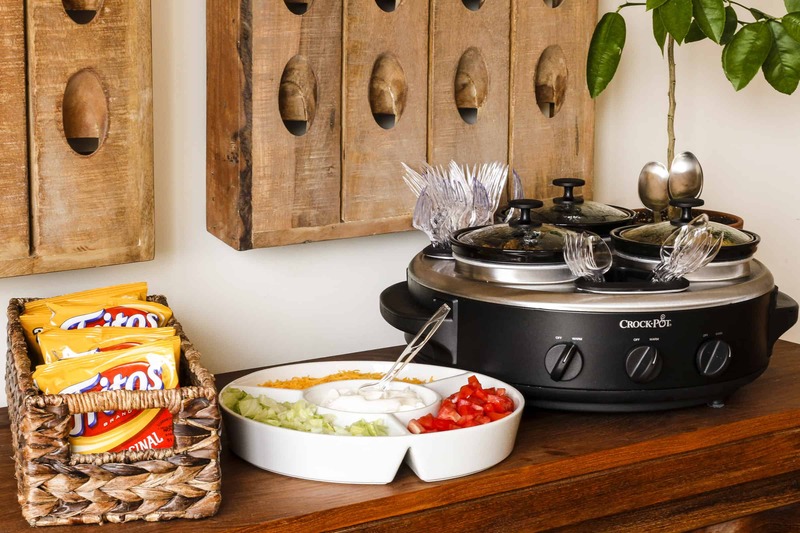 The Crock-Pot Triple Dipper is the perfect way to serve walking tacos. The three 1-quart mini crocks hold the perfect amount for a small crowd! I filled mine up with seasoned ground beef (2 lb. browned ground beef + 4 tablespoons of homemade taco seasoning + 1/2 cup of water), Velveeta queso (16 oz. Velveeta + 1 can Rotel), and spicy black beans (2 cans black beans drained and rinsed + homemade taco seasoning to taste). A cheaper alternative to the seasoned ground beef is this seasoned beef & beans taco meat, which will really stretch your ground beef further. Update August 2016: Unfortunately, it looks like the Triple Dipper has been discontinued — bummer! 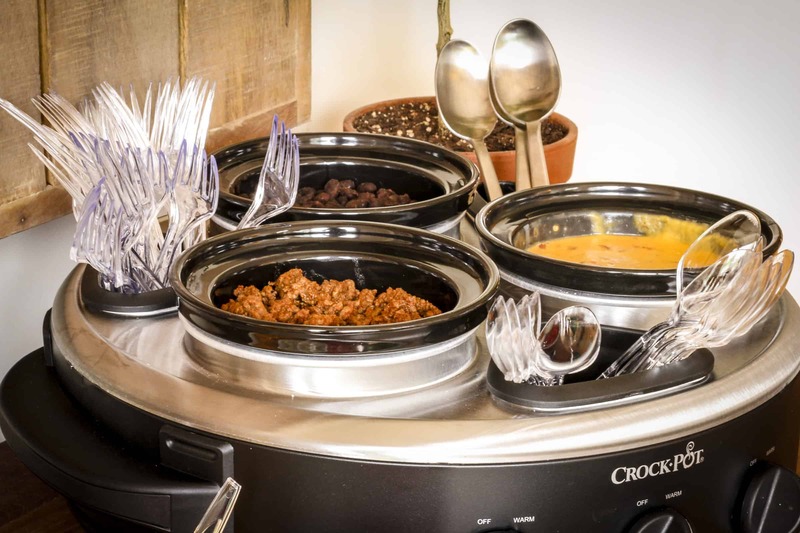 Two or three of these Crock-Pot Little Dippers would be a great alternative for keeping your taco meat and other fixings warm. Additional toppings I had available were chopped lettuce, diced tomatoes, shredded cheddar cheese, and sour cream. Fresh pico de gallo and/or this super simple guacamole recipe would be perfect, as well. There really is no set-in-stone walking taco recipe. Just open a snack size bag of Fritos (or Doritos) and add your desired toppings. (I like a little of everything.) Eat it straight from the bag, and the entire thing can be tossed when you’re finished — so simple! PIN IT NOW! CLICK HERE TO ADD THIS WALKING TACOS RECIPE TO YOUR EASY DINNER RECIPES BOARD ON PINTEREST! P.S. For those of you that prefer Doritos, you can find the snack size bags of Doritos on Amazon, too — as low as $0.26 per bag! Have you ever served walking tacos? I can see these being a big hit at birthday parties, too! Or what about for camping?! Check the comments for lots more suggestions. You forgot the most important part (according to my family! Add all ingredients and shake before eating. Carefully. Our church sold these at the county fair back in the 80’s, except as frito chili pie! Yummmmm!! We use Doritos and cut the bag on the side – makes it so much easier to eat out of the bag. I love these with nacho cheese doritos. Since the Kentucky Derby is close to Cinco De Mayo I think I’ll do these for our gathering to watch the Derby. Great idea!! That’s so weird! In Iowa, we always use Doritos. I’ll have to try Fritos! We call these Frito Pies here. They’re made with red chile, pinto beans, cheese and onions. We made these camping, if you buy bagged lettuce and cheese, you have no clean up except you pan you cooked your meat in and the crock pot. Love this recipe! Great recipe. When I was in high school, we made these for football games in the concession stands. Our only difference was we used Doritos instead of corn chips. Adds a little more flavor. I also run a stand for my daughters varsity basketball team. Wanted to try them this year. What did u sell them for? Absolutely genius! The possibilities are endless! And I love that crock pot! Walk on Unsophisticook, walk on!! Love it. These are really easy and kids love them. I use cheese doritos for the walking tacos and make another version with the fritos using chili, cheese, sour cream, and jalapenos as toppings. So yummy and always a big hit! We call them ‘taco in a bag’ in Canada. I make the taco meat up ahead of time and then freeze in single serve bags, then just take the remaining ingredients along for quick lunches while camping. I’ve been wanting to try those walking tacos for a while. You’ve conviced me, I have to try next week! We love walking tacos but always serve ours in Doritos bags! Will totally have to try the Fritos version! How very clever and can’t wait to give these a try!! Sounds Yummy! Love these! We serve them at KSU tailgates – they’re perfect! Haven’t seen a crock-pot like that one though; love it. Both of my sons play travel sports & going away to tournaments can be tough on the budget. So, a few parents started implementing a walking taco night at each tourney & it works out great. Everyone brings meat, taco fixings or a dessert to share. Such an inexpensive & easy version of a pot luck. The only cooking involved is for the person(s) that brings the meat. If anyone has family in the town we’re in, they typically take the job of making the taco meat. Otherwise, people have cooked the hamburger with seasoning ahead of time, popped it in a cooler (later hotel fridge) until the day of the meal & then put it in the crock pot on low/keep warm setting until dinner time. I love this! What a great idea, Wendy! My kids love these, they are always a big hit at the concession stand for our school sporting events. 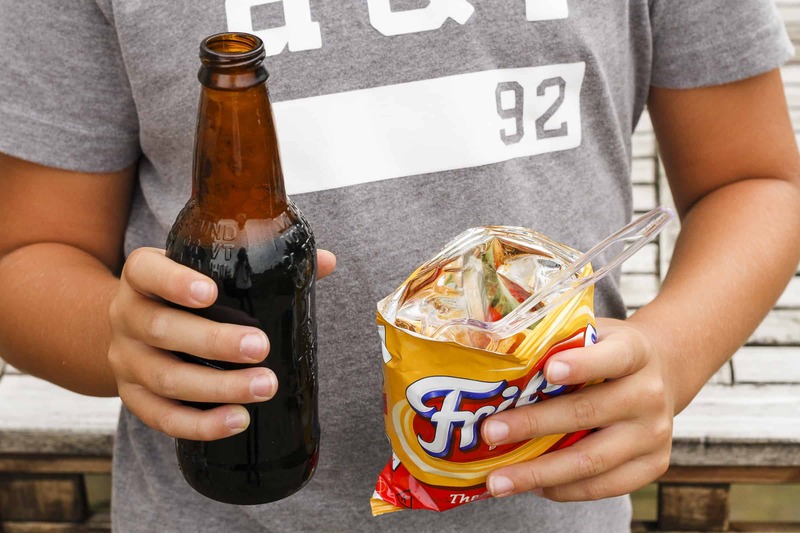 We grew up with these at the pool in the summer, and they’re called Frito Pie in Louisiana and Texas! Mmmmmm. These are so fun! Love that crock pot! i help run a concession stand and we make these but use cheesy dorito chips..yummo! Thanks for posting this idea! I received one of the triple Crock Pots as a gift from the Kansas Star Casino near me and I was trying to think of something to serve in it at our office Halloween party tomorrow. I am totally on board for walking tacos, and even more with that crock pot. What a great idea!